I am a Honda Brio V MT user from Pune. I am so happy with its performance that I gifted the same car to my girlfriend Riya last month on her birthday. Its sporty look and beautiful interiors makes me fall in love with it every morning to my office. I am a businessman and I have other cars as well but I love driving my Honda Brio V MT the most. And so what else could I select for my beloved for her 25th birthday. Also the excellent color range which comes in it is an eye candy. I gifted her green colored Brio which is her favorite color. The smooth acceleration and easy driving is what my Riya loves about the car. The average given by the car is satisfactory but I guess that is not an issue for her and for me as well. The features of the car are amazing and the interior very beautifully designed. The stereo is nice and we love it even more when we are on a long drive. And the best part is that now she loves to be the driver instead of me. And why not, the power steering is so smooth that she loves to try her hand on it. Also other features in the car are very nice as compared to its price. It has alloy wheels, driver airbag, front passenger airbag, central locking, power windows and everything which a nice car must have. And a hatch having all the qualities of a good car with super sporty look is a treat in its own. And you know what the best thing is? You and your girlfriend are having the same car. And also the happiness in her eyes when she takes me on a drive in her own super-stylish hatch. And the most important thing Riya’s mom and sister also love it. Her sister is in love with the ultra modern look of HONDA BRIO V MT and her mother loves the comfortable interior. And she has even started learning to drive it. Uncle likes the fair mileage given by the car. Wow! People think it’s expensive? Definitely not for me! The three ladies’ happiness is priceless. Honda is my favourite brand in cars. I like honda cars. Honda Brio is a classy design. I love you too. 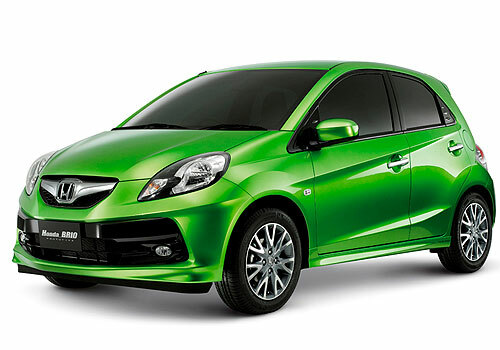 Honda Brio is standardized looks comfortable, great performance and dynamic styling.